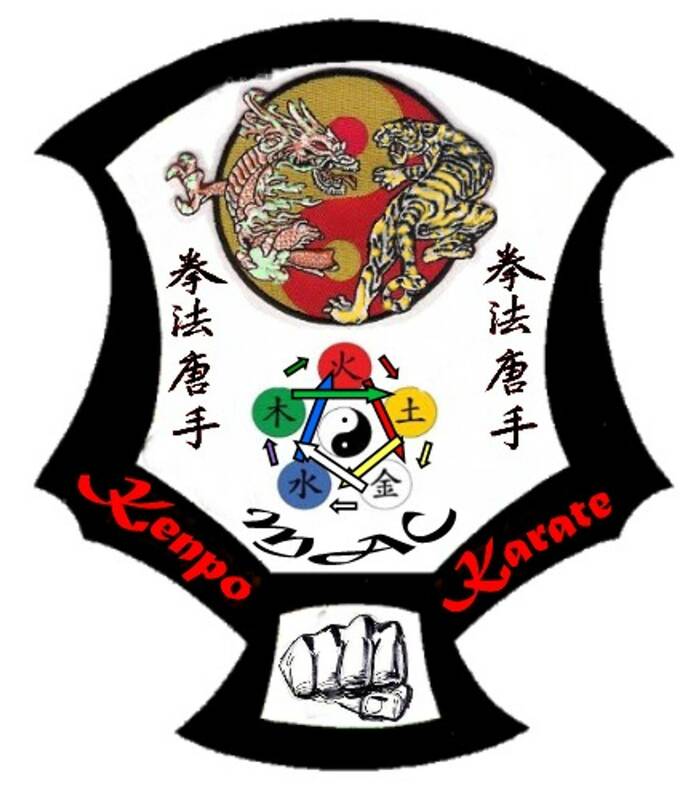 A p unch involves hitting with only the knuckles, however Kenpo strikes do not just use the knuckles. Punches are generally long/mid range weapons. When in closer, elbows replace punches. They are the short range equivalent of a punch. Part of that is common sense (if you're in too close to get in a punch, try an upward elbow). It’s vital you are aware of the many strike points you have in your arms and hands REMEMBER you have much more weapons with your hands than a punch. 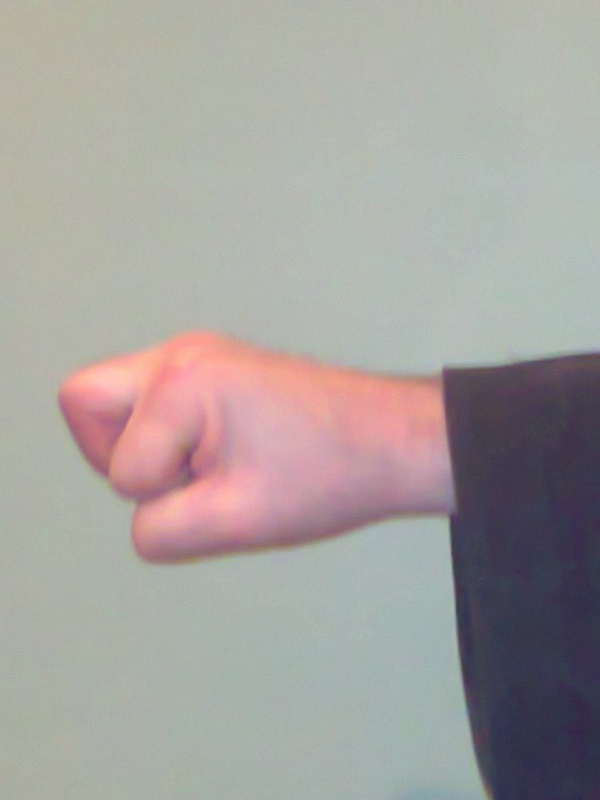 Punch straight out with fist, knuckles facing up. Punch slightly upward, knuckles to outside of body. Beginning with hand at your side, punch upward and away from you, stopping at the height of your lower chest. Knuckles are generally away from you. This strike is done in numerous directions and at numerous angles. In general, you are striking with the bottom of your fist (outside the little finger). Swing fist from in front of your body, past your side and behind you, striking at groin level with the bottom of your fist. Opponent is behind you. 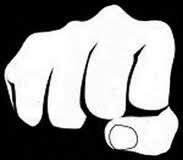 Swing fist (circular) in towards you, down and away from you, striking at groin level with the bottom of your fist. Opponent is in front of you or even beside you at 45 deg. 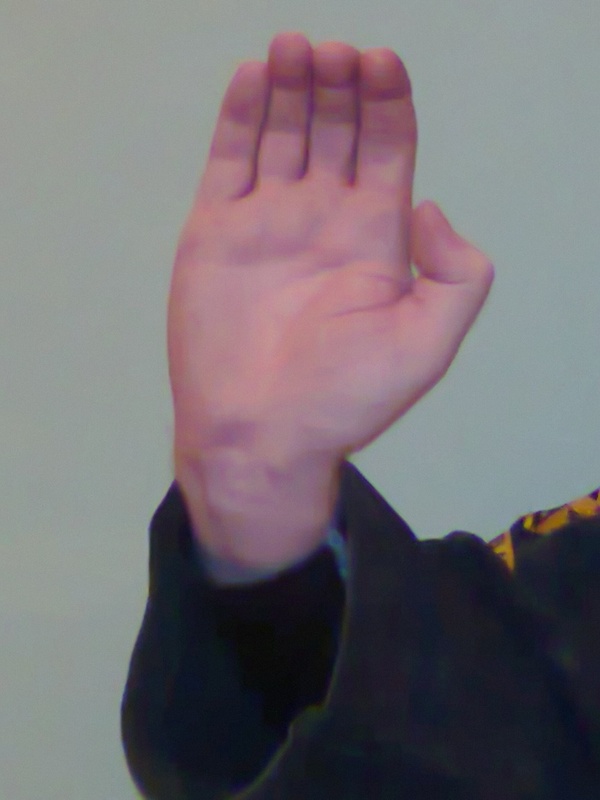 Karate chop hand striking on attackers neck, palm down arm bent coming from across my body. 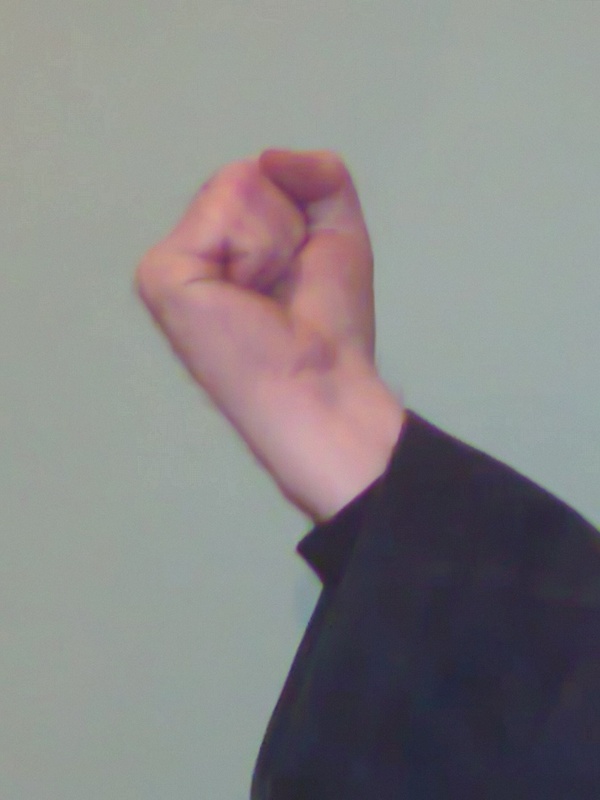 Raise arm (open hand) over your head and straight up then drive elbow down onto attacker while making fist with your hand. Start with arm fully extended downward (i.e. arm hanging at side) then drive upward with elbow. This is almost always used to strike an attacker under the chin. This strike can be used to the front, side and back. Move arm straight out in front of body then back behind body. Bend arm at elbow as it moves back behind body. Move arm across body and strike back to original side. 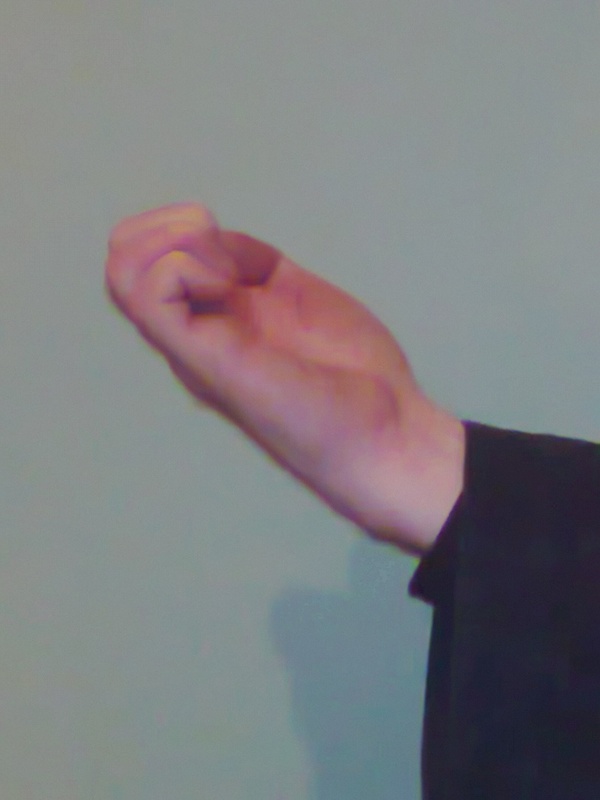 Bend arm at elbow as it moves across. Upper arm should be lined up with back. Push arm out slightly across body striking attacker in the face and pushing across. 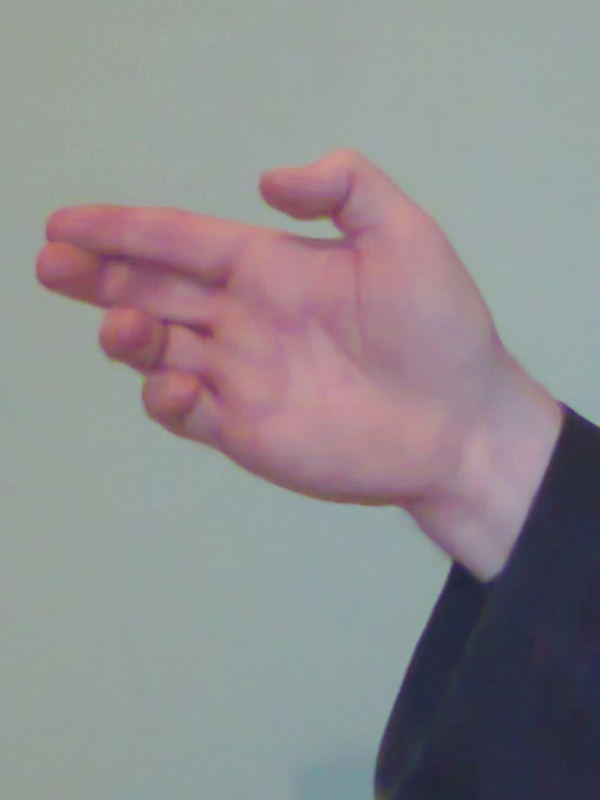 This strike can be executed in multiple directions and to multiple angles, but we always strike with the lower part of our open hand with the fingers tightly kept together. 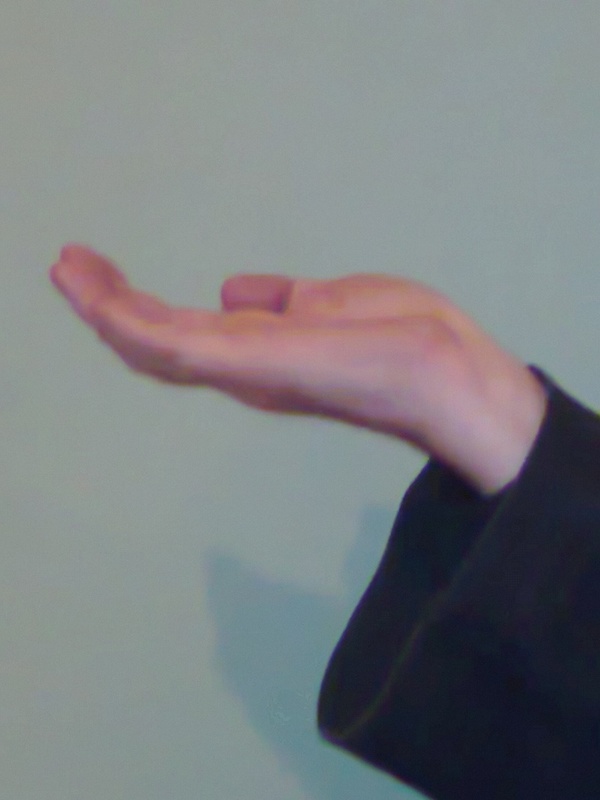 Essentially the same as a Heel Palm, but finger are bent (like a claw) and rake across the target. This strike is mainly used on the face. Using first 2 fingers slightly bent. Fingers must line up or they get broken. Swing arm from outside body to inside body, hand flat and palm down, striking with thumb and forefinger. 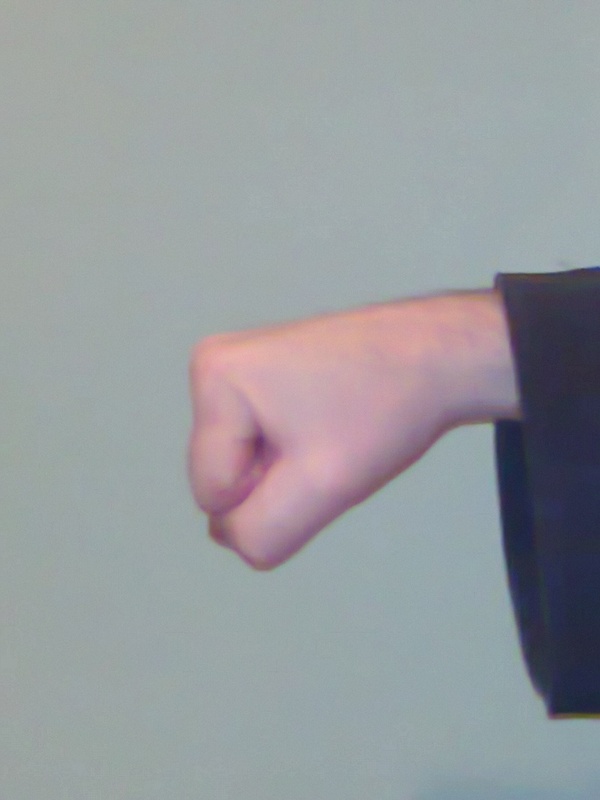 Vertical fist position, extend middle knuckle slightly so it's the contact point. This strike is done in many directions and at many angles. Strike with the knuckles using the back of the hand. It's like a slap with a closed fist. Kicks can be done with either a thrusting or snapping method of execution. With a snapping kick, you strike and then pull your leg back, landing back in your original stance. With a thrusting kick, you strike and you tend to land forward. Kicks are generally long/mid range weapons. When in closer to your opponant, knee strikes replace kicks. They are the short range equivalent of a kick. When doing a snapping kick it is VITAL that you return to Neutral Kick Position (NKP) as then you can strike with another kick or move in a direction that you desire, sideways, forwards or backways. Bring front foot back into cat stance, knee up to chest (neutral Kick Position), kick out striking with ball of foot, return to neutral kick position and then land in front or back stance. Bring rear knee up to chest (NKP) and, as we kick out striking with ball of foot, torque and push front foot and hips into the kick. Front foot on the ground turns from 45 degrees to facing direction of kick, after kick impact return to NKP and land in your desired stance. Bring front leg into cat stance and then NKP. Then pivoting on rear foot so we are sideways to attacker and snap kicking foot into attacker kicking with heel of foot. Return to NKP and then land into your desired stance. Bring rear leg up to front leg so feet are touching and do a side kick as outlined above with front leg. Bring rear leg forward and go into twist stance, you will be pivoting on rear foot so you are sideways to attacker. Lift the kicking leg into NKP and thrust foot into attacker kicking with heel of foot. Following the kick return to NKP and then land. You’re your desired stance. Bring rear leg behind your front leg and into twist stance. You’re your kicking leg into NKP and thrust side kick into attacker kicking with heel of foot. Return to NKP and then land into your desired stance. Bring front leg up into NKP. Then pivoting on rear foot so we are sideways to attacker and snap foot into attacker kicking with top of foot (instep). Return to NKP stance and land in original neutral bow. Bring rear leg up to NKP while pivoting on front foot so we are sideways to attacker and thrust foot into attacker kicking with top of foot (instep). Land forward after kick. Rear leg crosses in front of your front leg going into twist stance and then NKP. 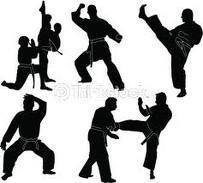 Your front leg swings into roundhouse kicking position and kicks with the instep section of your foot. Rear leg crosses behind your front leg going into twist stance and then NKP. Your front leg swings into roundhouse kicking position and kicks with the instep section of your foot. From a 45 Bow arrow stance, hands up for balance and protection, look behind as you Cat your rear leg up to your front leg. Kick behind you with heel of foot. Following the kick return to cat stance and then to 45 bow stance. From 45 bow stance, turn backwards and bring rear leg up to front leg in cat, look behind and thrust cat leg backwards, landing forward in opposite bow. From forward bow, grab attacker around neck, pull them in close and tight and drive knee into their midsection. Leg down and skip into opposite bow and repeat. From neutral bow, back leg comes up partially bent, twist body backwards and swing back leg around to strike with outside of foot. Side kick then bend knee and pull heel back towards you into attacker. Natural stance. Bring leg across body and up in the air back towards body and slap bottom of foot down on attackers opposite shoulder and land heel of foot on ground. Front leg up, into attackers groin with instep and pull back towards you. Bend rear leg at knee, heel up quickly kicking up into attackers groin with heel and pull towards you. The Stance Sets are used to drill in the basics of good solid stances and smooth transitions between them. 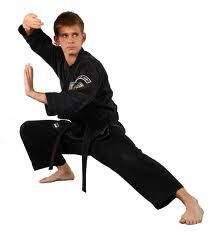 Stances are one of the major corner stones of our movements in Kenpo. Toes and heels together, hands at sides. Feet shoulder width apart, arms relaxed at side. Feet outside shoulder width, knees bent, hands at side bent, fists in at waist, knees out over ankles. From 90 Deg horse, drop leg back, feet at 45 degrees, front toe parallel to rear heel, front arm out at 90 degrees in front of face, rear arm in close covering midsection. From a 45 Deg horse, turn rear foot to face front, rear foot flat, rear leg straight, front knee bent. Should not be ale to see front toes. From forward bow arrow stance, reverse your hand guards and as you do you straighten your front leg and bend your rear leg. Start with the heel of one foot up against the instep of your other foot (your feet are at a 90 degree angle to each other). Slide the heel foot forward so the heel is where the toes were. Move up onto the ball of that foot. Start with your heels together, toes apart at a 45 degree angle. Move the heel of one foot forward so the heel is where the toes of that foot were. Move up onto the ball of that foot. From a 45 deg horse, move your rear leg forward in front of your front leg and towards the corner so that the inside of your foot is facing the corner. Up on the ball of your other foot, keep knees bent. From a 45 deg horse, move your rear leg forward behind of your front leg and towards the corner so that the inside of your foot is facing the corner. Up on the ball of your other foot, keep knees bent. Crane Natural stance, move one leg up and place bottom of foot on the inside of the other knee.